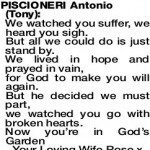 The Funeral Mass for the late Mr Antonio (Tony) Piscioneri of Donnybrook will be celebrated in St Mary's Church, Bentley St, Donnybrook commencing at 1.00pm on FRIDAY afternoon (12.4.2019). Following Mass, the cortege will proceed to the D ONNYBROOK Cemetery for Burial, arriving at 2.45pm. Vigil Prayers and Rosary will be recited in the Funeral Chapel, 9 Spencer St, Bunbury at 7.00pm tomorrow, THURSDAY, evening (11.4.2019). A Viewing will be held prior to Rosary from 6.30-6.45pm for those family and friends wishing to see Tony.